5. irony.or.death did a not great job of trying to convince bribe Schneeble and you didn't really need to convince him to fight me, just to not help me fight you. And to be fair, we have a whole LP of proof that it's pretty easy to "convince" me not to fight (or at least to only pretend to fight). Granted I will try to get paid twice for it but that's my problem. Yes, I realize we'd been saying turn 76 but I could only find some small ozelotl forces being chased by demons in turns 76 and 75. I know that you people paid to see gratuitous bloodbaths so I just kept going backwards until I found one. Mictlan is going down. There is no escape, so Incy does the noble thing and sends everything he has against the only player who hasn't chickened out and asked him to fight the other two. In so doing he has carved a swath of territory out of Pangaea's territory and has a fort under siege. Pangaea has taken the brunt of Mictlan's counterattack because Irony.or.Death is not a punk and didn't going crying to Incy asking for mercy as soon as it looked like he might have to fight a real battle. He has taken a bit of territory from Mictlan, but more importantly he can't let Incy's dying gasp go on any longer than it has. He has to finish this opponent off and focus on the next. It's under the effects of Natural Rain, which is just like the spell Rain except nobody cast it. Heat auras are diminished, also fire magic and flying generate more fatigue. 5 Zmey - Each one has a Lycan Amulet for berserk and regeneration. One of them is totally blind and another one is missing a head and an eye besides. 2 Bane Lords - They both have their raiding gear, but one of them is blind and berserk (probably from picking up the Lycan Amulet of a zmey when raiding together with it). Troll King - With Earth Boots and a Blood Stone and a stack of Earth gems, he is almost certainly here for buffs. Sea King - With a Water Bracelet and the Robe of the sea and a stack of Water gems, he is probably also here for buffs. Vampire Lord - He's got some basic combat gear and a handful of Death gems, maybe he'll do something like Soul Vortex and then wade into combat? Tlaloque of the East - Ungeared amd just behind the front lines, who knows what he will do? Tlaloque of the North - Geared for combat but set to the back, surrounded by a Chill aura, and lacking in flying ability. I have no idea what his deal is. Wendigo - This nearly-grown (size 5) undead has a Fire Brand, a Charcoal Shield, a Hoorned Helm, Elemental Plate, Boots of the Messenger, and a Ring of Regeneration. He's set near the front and I expect him to rush forward and attack foes. 5 Priests - 3 Mictlan Priests, a Rain Priest, and a Priest King are all scattered amongst the army. Only the Priest King is geared (with a Thistle Mace and some Nature gems) and set to the back. Nahualli - Gearless and in turkey form so I almost missed him. Father Illearth - Since he's one of the Elemental Royalty I think I'll break to give him his own section. 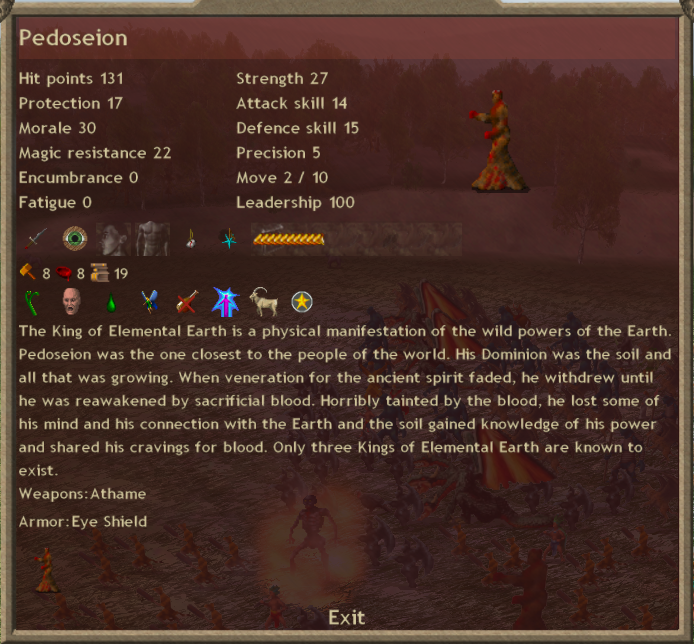 He normally has 15% regeneration (20 hp on his 131), fear (+0), and 7 each of Earth and Blood magic. Like the rest of the mixed-path royalty in AwesomeEndgame he generates one gem of each of his paths every turn. In this case that's an Earth Gem and a Blood Slave. I imagine that he is very useful for summoning infinity Demon Knights in addition to traditional high Earth and high Blood castings, but Blood magic is not one of my strong suits so I'm just spitballing. As far as troops are concerned, Mictlan has a collection of roughly 70 Jaguar Warriors, 55 Ozelotl, 50 Storm Demons, 6 Vampires, 15 Trolls, 15 Sea Trolls, 4 War Trolls and a Moose Knight and a couple of Sea Troll Guards. Mary Schapiro - The Vampire Queen herself is here, kitted out with a Vine Shield, a Marble Breastplate, a Horror Helm, Boots of the Messenger, and Precious. 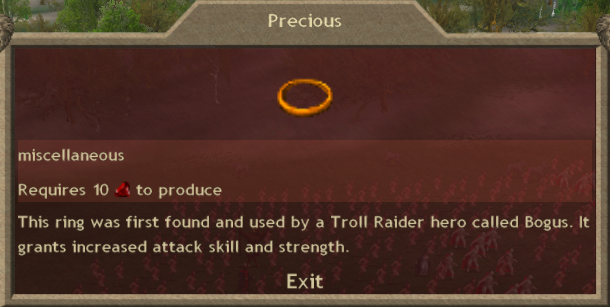 Precious is a unique item that can only be acquired by killing Bogus the Troll, one of a band of raiders who will sometimes attack your provinces in random events. Bogus and his raiders are based on a D&D adventuring party played by this game's creators. Granite Cyclops - It is wearing Earth Boots and a Blood Stone and thus has E6 and is probably going to spend the early part of the fight casting battlefield enchantments. 2 Mechanical Giants - One of them wields the Harvest Blade and Fenris' Pelt (both unique artifacts), but they are both here for melee combat. It grants the wielder Fear and sets him Berserk and also anybody hit by it gets the Crippled affliction. 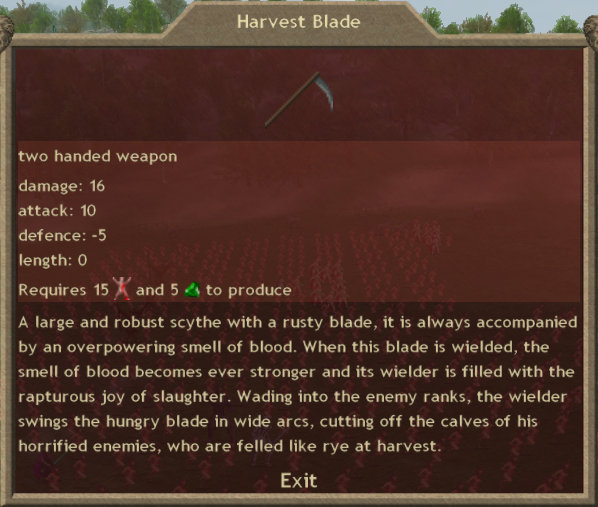 I'm not sure how useful berserking will be to a stabbing robot that already does not know fear, but there you have it. 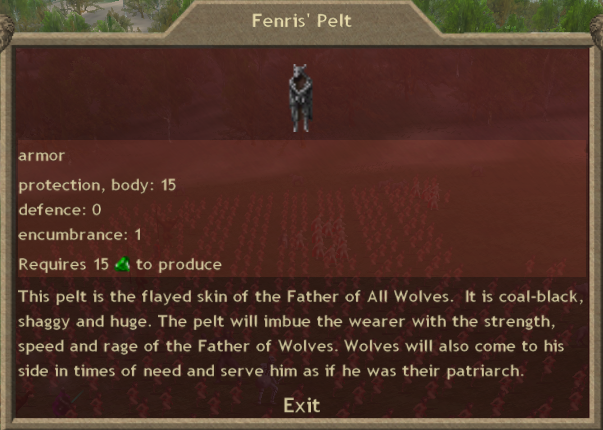 It grants the wielder a little bit of Cold Resist and sets him Berserk and also casts Howl at the beginning of battle (which summons 10 wolves around the edges of the battlefield, or 20 if the battle takes place in a forest or mountain province as this one does). Iron Dragon - Ungeared but still ready to kill as all Iron Dragons are. 2 Circle Masters - Both of these are ungeared as well but they can still summon skeletons or whatever. Wraith Lord - With W3E3D3 and carrying a Skull Staff. He's definitely here to cast stuff, and also because he is immortal which is a theme in Mary Schapiro's army. 9 Pans - Most of the have Blood Stones and one has Earth Boots. Expect buffs, at least early on. Then battle magic. Tarrasque - This one has 4A4N and a Bag of Winds to boost his Air Magic by one and to summon a little Air Elemental at the start of every fight. I expect more buffs, like Fog Warriors. Roc - We haven't seen one of these yet. They're pretty cool, really. They don't have the best slots but they've got A3 (sometimes A4) magic, a fantastic mapmove of 5, a good chunk of hitpoints, and stormflying. 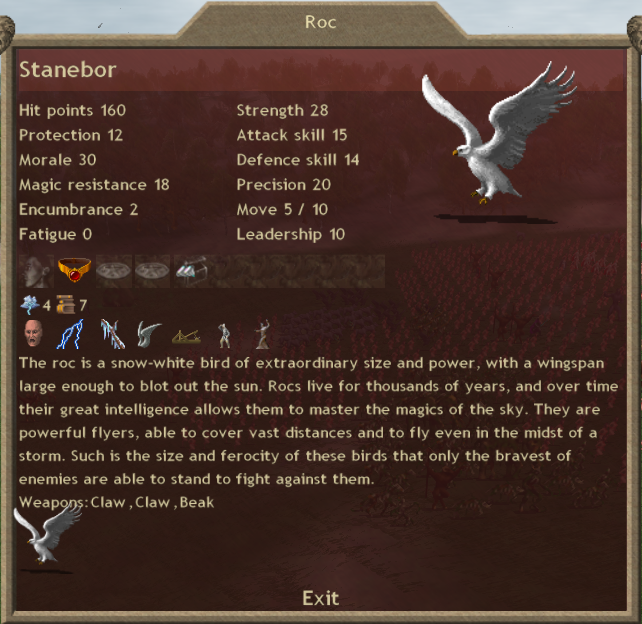 They're pretty capable and relatively easy to get, showing up in Conjuration 6, requiring A4 to cast and using up only 15 Air gems. The Panic army is 800+ Maenads, 40 Carrion Beasts of various shapes and sizes, 35 Satyr Revelers, 20 Black Hawks, 13 Vampires, and 60 Wolves (a third of which appeared around the edges of the battlefield). First of all, I recorded this fight and uploaded it to youtube. It's just under 7 minutes long and that is after I hit "n" to skip t the next round with brief pauses between starting around maybe the 4:15 mark. Also, sorry I don't have an HD version like ski dos in his arena battles. 7 minute videos take long enough to encode and compress as it is. You can watch it here and, because my time is limited I will talk about it only briefly in this post. Properly buffed Maenad hordes are pretty terrifying. Disintegrate didn't hurt either. Army of Gold + Fog Warriors was probably sufficient to carry the day for Pan, frankly. Mictlan's entire force is all but annihilated, at the cost of fewer than 200 cheap (or free) chaff units out of a starting force of 900. Edit: No longer private. Whoops!